The latest material from Marvel's Captain America: The Winter Soldier is a new character poster featuring Falcon, a character played by Anthony Mackie. 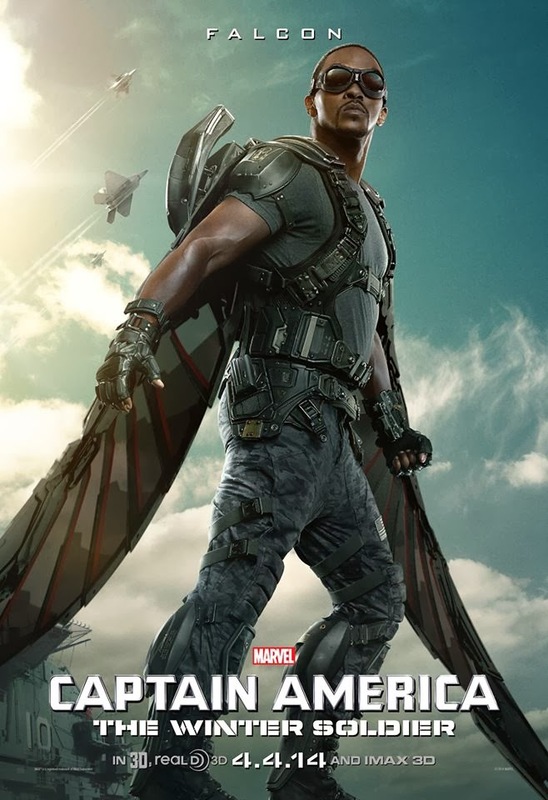 Falcon's expertise is on aerial combat with the help of an specially designed wing pack, which you can see below. He will join Chris Evans' Captain America, together an ensemble including Scarlett Johansson, Sebastian Stan, Cobie Smulders, Frank Grillo, Emily VanCamp, Hayley Atwell, Robert Redford, and Samuel L. Jackson. This Kevin Feige produced film is directed by Anthony Russo and Joe Russo. Here is the new character poster of Flacon, otherwise known as Sam Wilson. As Steve Rogers (Chris Evans) struggles to embrace his role in the modern world and teams up with Natasha Romanoff, aka Black Widow (Scarlett Johansson), to battle a powerful yet shadowy enemy, the Winter Soldier (Sebastian Stan) in present-day Washington. Captain America: The Winter Soldier will hit theaters near you on April 4, 2014.